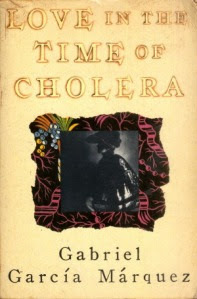 Love in the Time of Cholera is a Spanish novel written by Colombian writer Gabriel García Márquez. The English translation is written by Alfred A. Knopf. I have been meaning to read this book for ages and finally started reading it a couple of days back. I am halfway done, and I have to say, if it were upto me I would have called it "Death in the Time of Cholera"; too many people die way too soon!! Either way, I sort of like the book; it doesn't have too much sorrow or the depressing things I was expecting. It has a tinge of humour to it, and the language is beautiful! A long time ago, on a deserted beach in Haiti where the two of them lay naked after love, Jeremiah de Saint Amour had sighed: “I will never be old.” She interpreted this as a heroic determination to struggle without quarter against the ravages of time, but he was more specific: he had made the irrevocable decision to take his own life when he was seventy years old. I love Gabriel Garcia Marquez. My favorite is One Hundred Years of Solitude. Great teaser. If you get a chance, mine is here. I have read this and also One Hundred years of solitude.I sort of liked this book especially the ending. Wow... one of my favorites..
@Julie, Ya, so many people recommended me One Hundred Years Of Solitude as well! I'll read it after this one! @Abhinav, don't tell me the ending! But now you've made me curious to know!! I've been very curious about this one...I'll be watching for the review. I've heard great things about Love in the Time of Cholera, but haven't ever picked it up. Glad to hear you're enjoying it! A good teaser. I have heard a lot about this one, but have not (yet) read it. Thanks for visiting! Great tease, I haven't seen this one so thanks for sharing. Thanks for stopping by my blog! Very stirring, and obviously the voice of youth.